Christie D. Green (“Ms. Green”) was shot and killed by fragments from a frangible round shot at and through a door when Richmond Police sought to gain entrance to a home to execute a search warrant. Cuthbert Law Offices sued various defendants in this wrongful death lawsuit including the SWAT officer, who fired the shot that killed Ms. Green. On December 29, 1998, Captain John B. Buckovich (“Buckovich”) led the Richmond Special Weapons and Tactics (“SWAT”) team on a mission at 1112-C Dove Street in the City of Richmond. The purpose of this mission was to serve a search warrant at a home where illegal drugs and firearms were located. Sergeant George J. Ingram (“Ingram”), a member of the SWAT team, was assigned the task of breaching the kitchen door using frangible breaching rounds. As part of initiating the entry, police employed a technique known as “rake and break.” The technique involves the breaking of a front window and announcing, “Richmond Police, search warrant,” while entry through a door at a different location is accomplished. While the “rake and break” was being employed at the front of the house, Ingram attempted to enter the residence through the kitchen door. The door was an exterior, heavy, windowless, composite wood door, with a lockless doorknob set below a single cylinder deadbolt lock mortised into the door. Prior to using the frangible rounds, Ingram attempted to open the door by turning the doorknob. While the doorknob turned freely, the door did not open and Ingram concluded that the deadbolt was engaged. Ingram then used a shotgun to fire frangible rounds at the door’s locking system. The frangible rounds fired by Ingram are designed to disintegrate into powder upon impact with metal. In attempting to breach the kitchen door, Ingram fired five frangible rounds. Ingram testified that his first shot was between the deadbolt lock and the frame of the door, and that his four subsequent shots were each an inch successively lower in a vertical line. At no point during the firing of the frangible rounds did Ingram re-attempt to open the door by turning the doorknob below the deadbolt. After firing five frangible rounds, Ingram still could not open the door by pushing it with his foot. A battering ram was used to open the door and enter the residence. Upon entry, the SWAT team found Ms. Green lying dead on the kitchen floor, her body draped over her three-year-old daughter, who was unharmed. As a visitor to the home, she had arrived approximately twenty minutes before the SWAT team began the breaching operation. An autopsy revealed that frangible round fragments caused Ms. Green’s death. After entering the residence, police found heroin, an assault rifle and high-volume ammunition magazines, two semi-automatic pistols, a silencer for one of the pistols, and ammunition for the rifle and pistols. 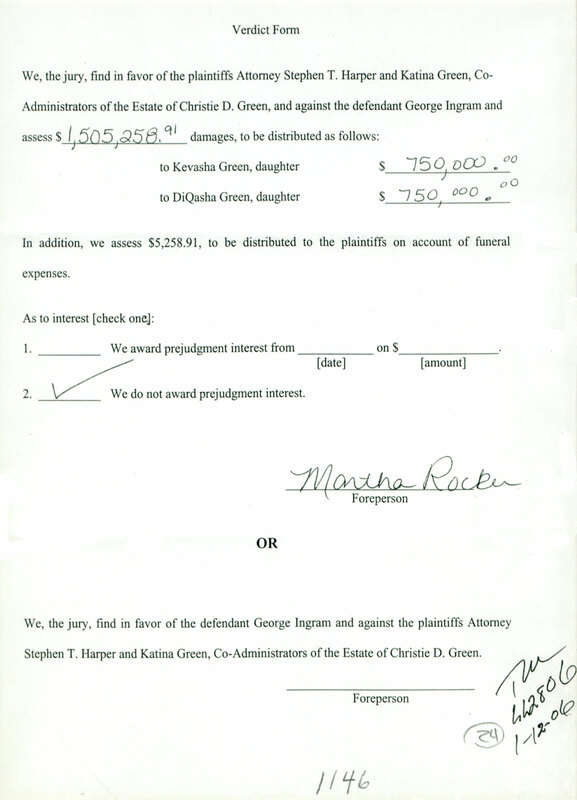 On Behalf of Mr. Green’s two children, a Richmond Jury returned a verdict for $1,505,258.91.